Demonstrators crowd Broad Street in front of the Tennessee Aquarium during the Chattanooga Women's March on Saturday, Jan. 20, 2018, in Chattanooga, Tenn. Thousands of demonstrators gathered at Coolidge Park and marched across the Market Street Bridge through the city's tourist district to show solidarity with a national women's rights movement. Thousands of women and supporters marched in Chattanooga Saturday afternoon in solidarity with a national movement supporting women's rights, speaking against sexual abuse and decrying the Trump administration on the anniversary of the president's inauguration. "I am out here for my mother, for my daughter and for everyone who feels their rights are being stripped by this presidency," Monteagle resident Mary Clark, 61, said as she listened to speakers in Coolidge Park after the march. Marchers gathered this weekend in hundreds of cities across the country and the world, as they tried to build on a movement that has only grown in its ambition. The movement extended from last year's Women's March, when millions of women protested President Donald Trump's inauguration and advocated for women's rights and other issues. A deluge of revelations about powerful men abusing women, leading to the #MeToo moment, has galvanized activists to demand deeper social and political change. And in the United States, progressive women are eager to translate their enthusiasm into electoral victories in this year's midterm elections. Melody Shekari spoke on the topic at the Chattanooga event, urging attendees to be politically active. The former Congressional candidate warned of the low representation from women at the state and local level. "It is time for us to make history here in southeast Tennessee," she said. "Women have not had an equal seat at the table. We need to vote and to volunteer, and we need to run for office to make that happen." The local march was a least as big as last year's, which had an estimated 3,000 people, event organizers said. "It has gone fantastically," event coordinator the Rev. Alaina Cobb said. "We have succeeded in elevating the voices of the real women of Chattanooga, who have experienced various forms of discrimination but refused to be silenced." Marchers said they wanted to see policy changes while advocating for equal treatment for all, and the event brought a range of representation from people of all ages. Local mother Amethyst Bogart was not able to come last year but brought her 3-month-old son Damien on Saturday. "I wanted to see everyone come together and work together," she said. " Even though he's so young, I wanted him to be part of such a big movement in Chattanooga." 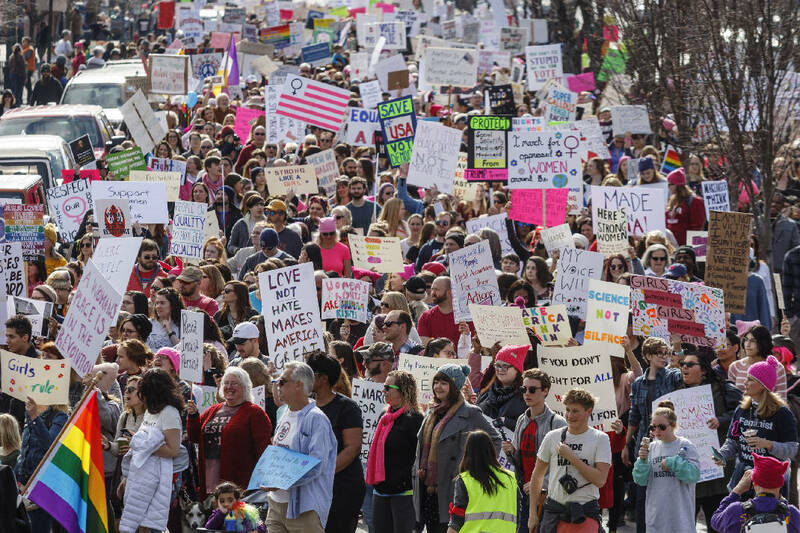 Across the region, thousands of people marched in Nashville, while more than 1,000 did the same in Memphis. Chattanooga Mayor Andy Berke was encouraged by the "huge energy" animating the women's movement and said it showed that "women in Tennessee are really pushing for a new direction." Jenny Sheridan Pecoraro of Nashville told The Tennessean that "the whole point is that you do something with this energy and this feeling." She said it gave those disappointed in the 2016 election results an outlet for their anger and a way to push for change. President Donald Trump tweeted that it was a "perfect day" for women to march to celebrate the "economic success and wealth creation" that's happened during his first year in office — while women across the nation rallied against him and his policies. "Get out there now to celebrate the historic milestones and unprecedented economic success and wealth creation that has taken place over the last 12 months," Trump wrote Saturday afternoon. "Lowest female unemployment in 18 years!" But people participating in rallies and marches in the U.S. and around the world Saturday denounced Trump's views on immigration, abortion, LGBT rights, women's rights and more. Mark Pace can be reached at 423-757-6659 or mpace@timesfreepress.com. The Associated Press and New York Times News Service contributed to this report.